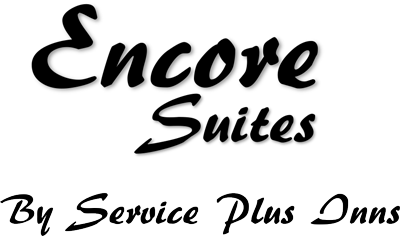 Encore Suites prides itself on catering to all types of reservation requirements. 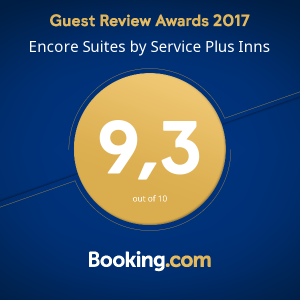 Whether you are travelling on your own, with a large group, bringing your family along, with a cherished pet or require an accessible guest room the Encore Suites has a room to meet your needs. With 94 guest rooms the hotel is pleased to welcome pets as an extension of your family and offer unique pet friendly hotel rooms for your convenience. Enjoy our Guest Appreciation Night with our management team. This is hosted every Tuesday Night at 6:00pm. We invite all guests to enjoy complimentary appetizers and beverages. All guest rooms at Encore Suites come complete with wireless internet, full sized fridges, microwaves, panini makers, flat screen televisions, coffee and tea stations, deluxe bathroom amenities, hair dryers, temperature controlled air conditioning and heat, work desk with chair, water bottles, white chocolate mousse cookies, access to the fitness center.